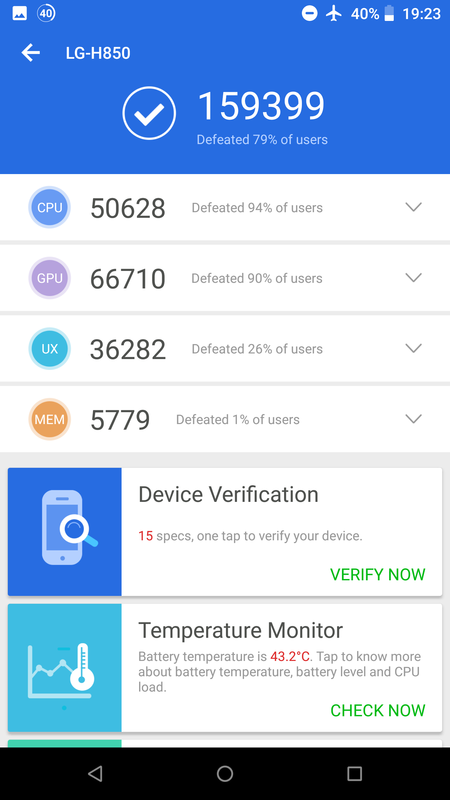 Inspired on this hardware mod I followed on my Nexus 4 years ago I decided to experiment with my LG G5 after experiencing unstable performance while gaming, tried tweaking the software with kernels and roms but with no noticeable results longterm. This mod is fairly easy, there is a 0.6mm gap between our processor-ram chip and the metal frame under the screen, I didn't find a copper plate to use and didn't want to wait to order it online so I made one by stacking copper wires and soldering them together, then gradually trimming it with sand paper, so performance could be even better. Used thermal paste on either side, stick the plate on the chip side first and apply some pressure. Attached pictures of the process and benchmark results. Results can be repeated indefinitely with no variation within the margin of error. Ambient temperature is very hot here in the south of Spain, with no AC used. Rom used is Lineage 15.1 by x86cpu stock kernel with no tweaks. Thanks! The processor on LG G5 is on the other side of the motherboard, it makes no contact to the back of the phone sadly, it would work even better. The good thing is that the screen frame is also made of metal and generates plenty of dissipation. I have a metal cover over my chips. How did you pull that off and did you have any issue with interferance after that? I assume thats what its for. What you see it's just a metal shield hold together with some clips, use your finger nail or the tip a knife to gently lift it up, it's reversible. It was probably intended to protect against electromagnetic interference but I'm pretty sure it's a preventive measure with no real benefits of having it on, the other three covers are still used and I believe no radio chips are on the section I removed. Got it! Used a artic thermal pad. When playing games I get a blue spot on the screen where the processor is it gets so hot so I know it working. Max temp is 58 degrees Celsius. Must have put something together incorrectly because my touch screen jitters a bit swiping like not all the digitizer sensors are seeing my figure. I do, thanks for the post. These phones are so cheap though. If I need another ill just buy one for 60$. Thanks, I used sand paper to make it the right thickness, if the metal plate is too thick you will see a purplish shadow on that area, it's just caused by too much pressure under the screen, try it several times without thermal paste until you see no shadow. The 0.6mm I said was my guess comparing it with some coins and their widths, it may be 0.5mm, don't have the right measurement equipment. Don't worry, the blue spot will go away completely. It makes sense for the shadow to be worse with heat because metal expands slightly with it. The motherboard should lie nearly flat over the screen frame after you put all the screws. I'm not sure about the touch screen responsiveness, had no issues on my test even with slightly thick metal plate, could go away without the screen stress under it. Its actually perfectly responsive, just not smooth. May be an app I installed so I will try resetting first. Not sure how I would file down a thermal pad. Its like a gritty rubber. Here's the link to what I got: ARCTIC - Thermal Pad 50 x 50 x 1.0 mm https://www.amazon.com/dp/B00UYTTDO6..._wvJBBbP1943TM Its super efficient. Maybe I could take it apaart again and press on the voard to flatten it a bit more. Oh, I misunderstood, probably 1mm thermal pad makes too much pressure on the screen when trying to flatten it to half of its thickness. I found very cheap metal plates on ebay and aliexpress which is always better in terms of thermal conductivity compared to thermal pads. Or maybe thinner pads are also available.